Hi, I have a problem with xfce4-weather-plugin version 0.8.6 installed on Linux Mint 18 Sarah 64bit. Until few days ago worked well, but now it says "No Data". same plugin version and same date! The weather URLs have been deprecated by the weather provider. Version 0.8.9 has the updated URLs. How did you try to compile it? What process did you use and what was/is the output of the configure and build commands? Note: the proper way to fix this is to create a bug report with the Mint Distro and encourage them to add the updated version to their official repositories. I will try to recompile it and install from source, so it will possible to send to you whole messages. At this moment it's impossible for me to do this because in the same machine I'm installing a newer version of Debian Stretch.. Anyway, I'll also report it to official Mint Distro as you suggested..
...then add the plugin to see exactly what error messages are being generated. 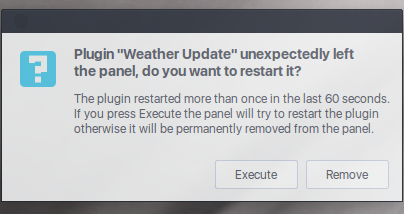 xfce4-panel-Message: Plugin weather-4 has been automatically restarted after crash. the same plugin and displays weather status in little icons. That is strange. 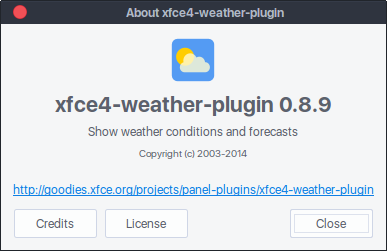 I used the following instructions to successfully build and run the latest version of xfce4-weather-plugin on Mint 18.0. After trying and trying and trying...TA-DAAAA!!! Want more strange? I am currently using an older installation of Mint, 17.3 I believe. xfce-weather-plugin 0.8.3-2 - and it is working fine. I remember installing another weather app the last time this one was having issues, or maybe even the time before that. I tried the other app I installed but went back to xfce's version to check something, expecting to see no data. Imagine my surprise when I had data in it. It has been working ever since. Apparently, at least one other weather application is using the same something or other that this one does, but updates it more often. Or something. Looking in Synaptic Package Manager just now, I see aweather and gnome-weather. I do not recall which I installed when xfce-weather-plugin had no data; it is possible that I installed both at that time. I may have had to add a PPA (Mint's main editions are based and built upon Ubuntu) in order to install one or both of these other weather apps. I have not been aware of any interruptions in the weather data since doing so. This is not a complaint, for obvious reasons - merely an observation. I'm curious to see what its connecting to. Works like a charm, I wonder why it isn't being updated dowstream, though. Please mentally insert virtual embarrassed pause here, to match the one that just occurred. I was under the impression that things were functioning okay here because I see weather information on one of my panels. It displays the current conditions icon graphic and (scrolling) six pieces of data, temperature, "feels like temperature," relative humidity, dew point, the direction the wind is coming from, and the wind speed. Because of all that, and because I see data when I hover my mouse over that area, I stupidly assumed that everything (in matters pertaining to this subject) was fine. I finally took the step of right-clicking on the panel applet. I only see forecast information for "Today" - which seems to be within the realm of reasonable expectations (it doesn't suggest that I'll be experiencing conditions under which I'll see snow, or standing water boil, lol); the other six days are blank. I will insert the requested information, but I suppose that it will more or less match what others have been experiencing. On the second - "Details" - tab, I see that my last weather data download took place on the ninth of this month. My apologies for speaking (typing) before thinking. Or was that instead of thinking? In my defense, I had originally installed an alternative weather app during one of the periods of time when everyone - including myself - experienced a no data issue and, if I recall correctly, I wasn't seeing a limited set of weather data (as I am now), I was seeing no data. The app that I installed allowed the user to choose a source - out of four - to retrieve weather data from. I soon decided to switch back to xfce4-weather-plugin and have no weather data until the issue cleared up and, when I did, this app was immediately back to functioning fine. Therefore, this time I assumed that things were okay without actually checking the details. I still wonder why this app started functioning (in the past) when I installed/used a different app. Was it the simple fact that I installed it, possibly adding a weather-related PPA in the process? My switching through all four choices for a data source? I think I had to sign up for at least one of those sources and receive some kind of API key. I am almost certain that this app began functioning again after switching back to it, even though there were still being posts generated here about others' ongoing issues. I wish this app was set up to give the user a choice of multiple sources for weather data. Either as a visible choice or as a behind the scenes fallback (attempt primary source, if that fails, try the secondaries instead).